In The Eye of the Sun:Mexican fiestas, published in 1997, there is a nice photo of masked dancers performing the Danza de los Chivos (goats) in Zitlala, Guerrero. Such photos are otherwise uncommon in mask books, but increasingly available on the Internet. 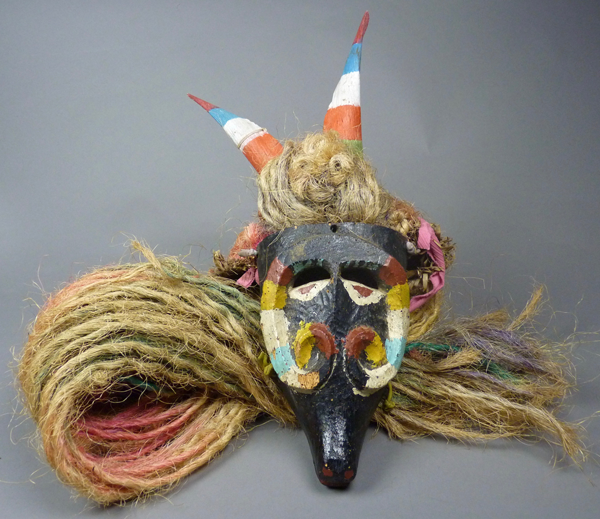 Today I will show two Chivo masks. 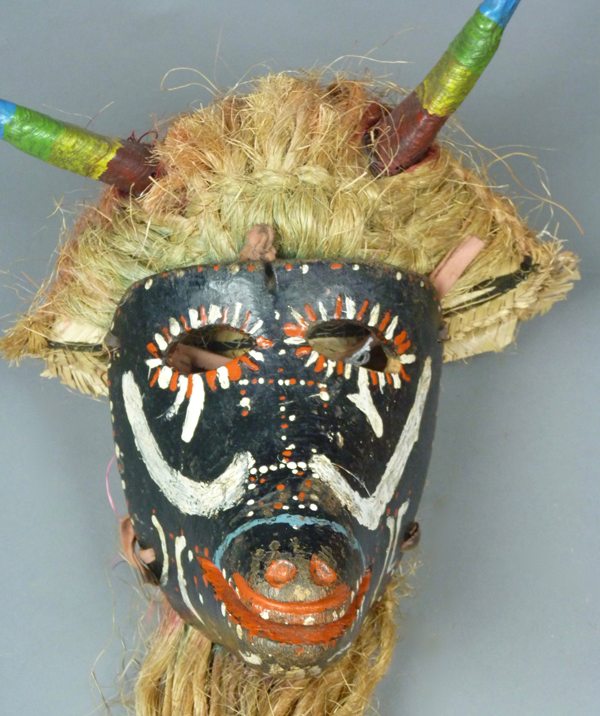 Each is unusual for having horns painted or carved in relief on the mask plus a long sisal headress with an attached pair of goat horns—two sets of horns. A YouTube™ video of Chivos from Quechultenango, a town near Tixtla and Mochitlán, reveals a variety of characters, including Chivos with horned headdresses but also Diablas or Diablitas (female devils) wearing the same headdresses with horns (see discussion of Diablas in my post of December 4, 2017). So, dances which I had regarded as centering on Diablas are at least sometimes actually named for the Chivos, who may be Diablos called by another name? Here is another video, apparently also from Quechultenago. Several of these dancers are wearing Chivo masks with horns along with a sisal headdress with a second set of horns. This third link is from Zitlala. These Chivos have prominent horns on their headdresses while they lack representations of horns on their masks. Here is the first of these mask/headdress combinations. (231). 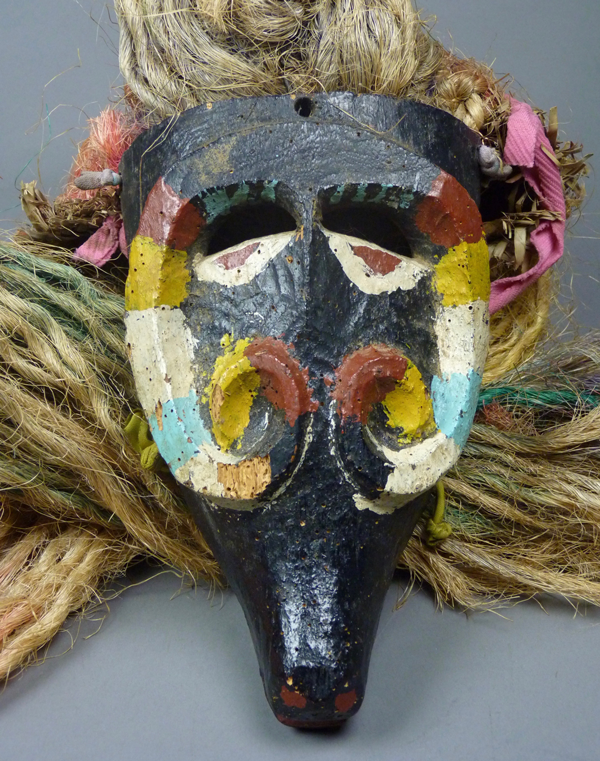 I bought this mask from John Kania and Joe Ferrin of Santa Fe in 1994. It was said to be from Tlapehuala, Guerrero. The paint has nice patina, with more obvious wear on the nose. 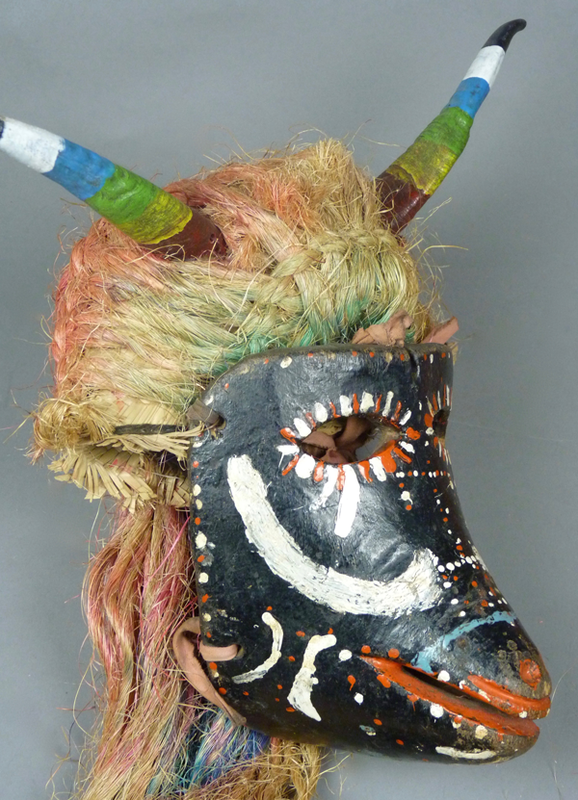 This mask is 6½ inches tall (17½ inches with the horns), 6 inches wide (horn tips are 12 inches wide), and depth of 5 inches. 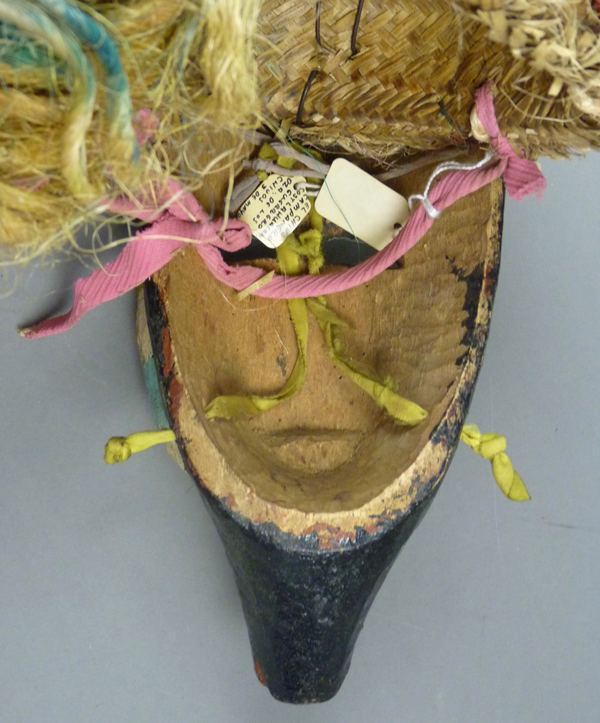 From the back, this is obviously an old mask with a new headdress. 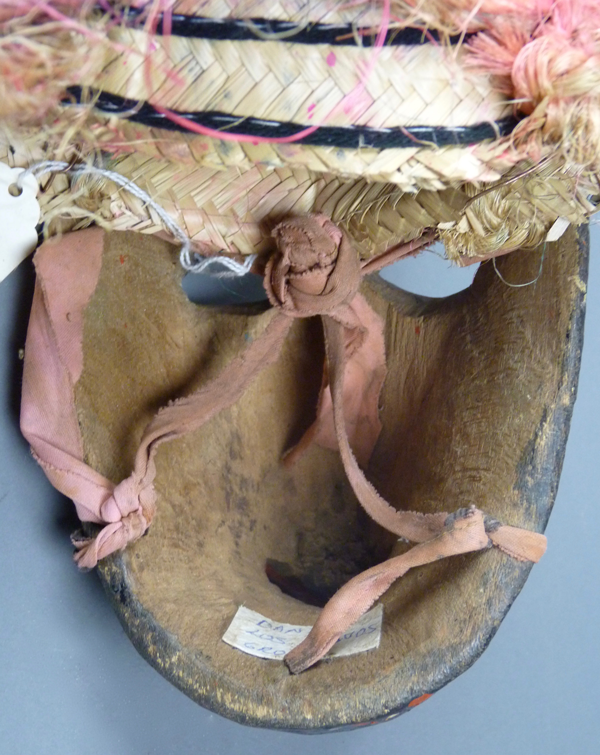 The second Chivo mask was collected in Coaxtlahacan, Guerrero. Here is a Danza de los Diablos video from that town. I don’t see any obvious Chivo masks, but this video does show the style of Diablos that dance with the Chivos. I purchased this one from René Bustamante, later in 1994. 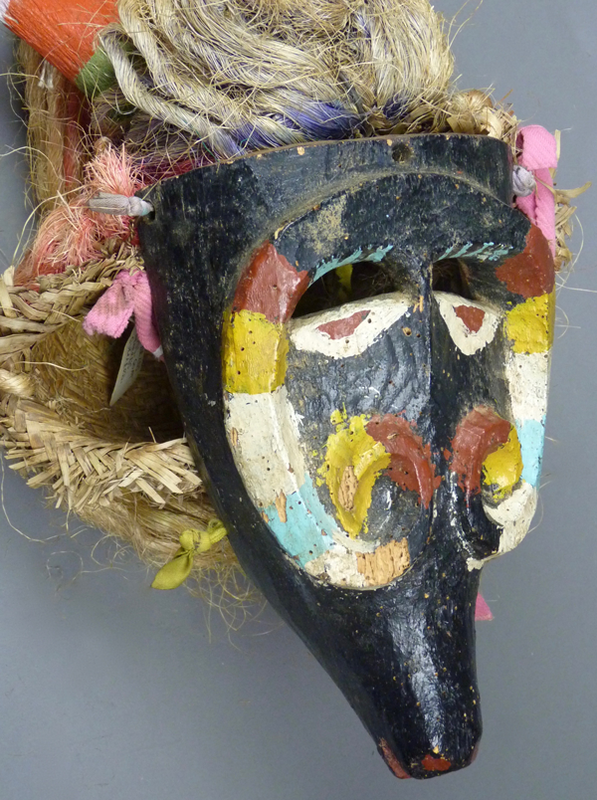 This is really a charming mask, with the curling relief carved horns that are painted in so many colors. There are signs of mild infestation damage by boring insects. 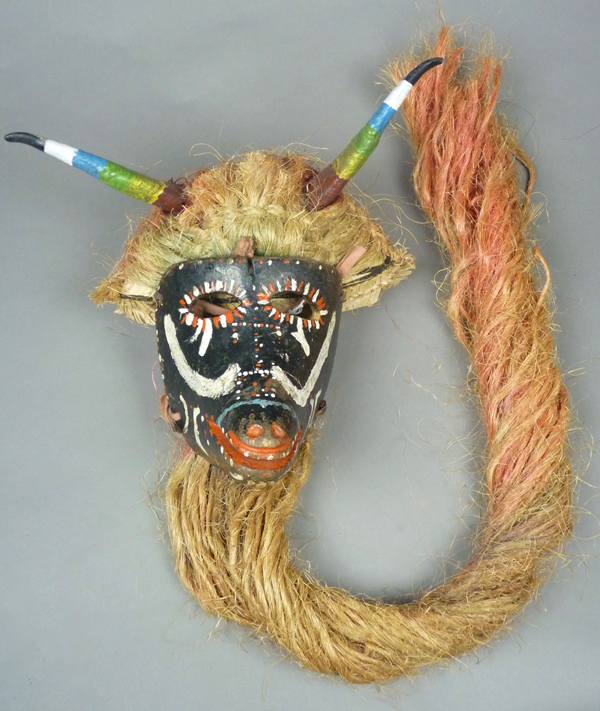 This mask is 9 inches tall (19 inches with the horns), 7 inches wide (horn tips are 10 inches wide), and depth of 3½ inches. This mask too has good wear on the back. I hope that you found these Chivo masks interesting. 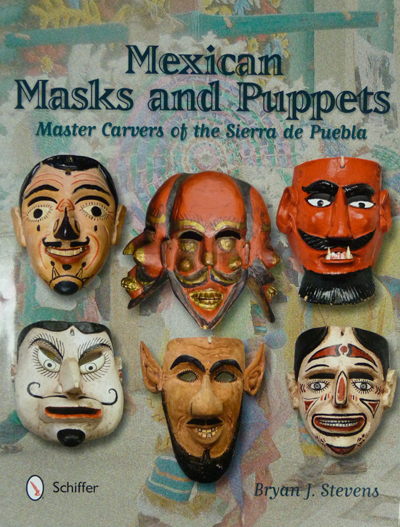 Next week I will show you Catrine masks from Tlaxcala.